The coming of the Christmas season reminded me of a heartwarming story from our time in Japan. In the spirit of peace and goodwill for all, I wanted to share it with you. 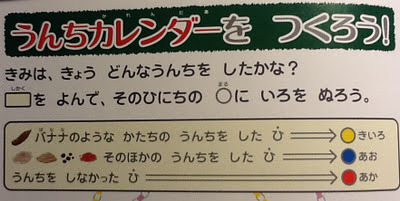 Hoping to get Sky started on learning Japanese characters, Ren signed him up for the Benesse Kid's Challenge (Kodomo charenji), a mail-order supplemental study series. Each month, we received a book, a workbook, and some kind of hands-on activity. Sky was thrilled to read the fun stories, put the stickers in the right places, and use the cool gadgets that came. Take this guy, for example, even now, every night at 7:30, he reminds Sky it's time for bed. 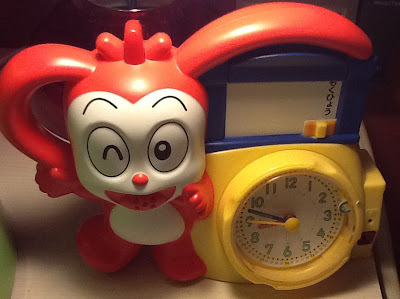 He came with a lesson about telling time and schedules. Every month brought a different theme related to the season, so the January issue was all about New Year's celebrations, the April issue was about the first day of school, and the July issue focused on stag beetles. By December of the year we spent in Japan, I eagerly anticipated the new issue's arrival. When I first took it out of the envelope, I was pleasantly surprised to see the theme was Christmas (as opposed to other end-of-the-year festivities). "Ahhh, it's a Christmas tree," I thought, "Sky will be so excited." Then, I looked a little closer. Wait, a minute. Is Shimajiro eating a Mister Donuts donut? And, aagh! What's he doing in the other picture? The subtitle on the cover asks: "Where does the food we eat go? "I started flipping through the pages and soon discovered that the theme of the month was the digestive tract, and the focus? Poop. How is it made? What color is it? Where does it go? What happens if you wait too long to take care of your business and you get backed up? 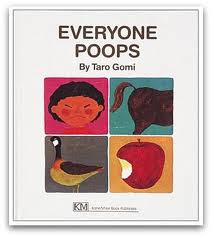 This issue had everything a kid (or anyone, for that matter) would ever want to know about poop. Soon disappointment set in. All the other months had themes that tied in nicely to the season. But poop and Christmas? I just wasn't seeing it. The instructions read: "Let's make a poop calendar! What kind of poop did you make today? Read the key below and color the circle for each day." And the key, in case you can't guess by looking, explains: "For days your poop is shaped like a banana, use yellow. For days when your poop has another shape, use blue. On days you don't poop, use red." It was brilliant. It taught kids to follow directions, to recognize and apply the appropriate colors to the appropriate circles, and to be aware of their bodily functions. This exercise even had the potential to teach kids to recognize patterns!! And the bonus? They end up with a colorfully decorated Christmas tree. 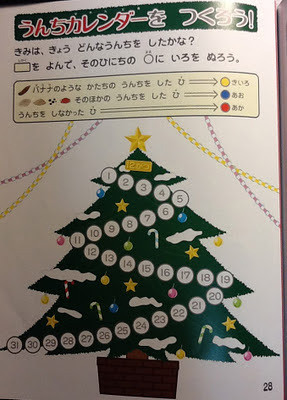 Now, I know I can be cynical, but I am pretty darn sure the only reason the folks at Benesse decided on Christmas and poop for the December 2008 issue is because of this chart. I'm not sure why I was surprised, though. This is the country that brought us Everyone Poops, after all. And that's what I love about my life. I couldn't make this sh*t up if I tried. That Christmas tree is hysterical and brilliant. And yes, if you come up with an idea so out there, you MUST build an entire issue around it. 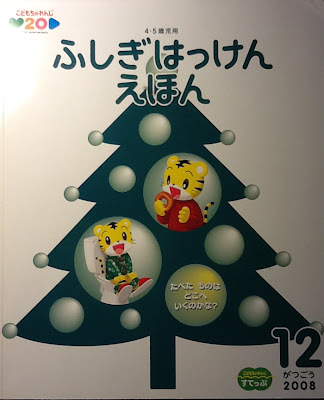 My favorite "Christmas in Japan" story: First Christmas morning there, 1976. We lived in a very Western-style home with a fireplace, and my parents had found a ratty-looking real tree. We were sitting around it, opening gifts and there was a knock at the door. It was the chimney sweep. My mom had called him a few weeks before, and asked him to come by sometime BEFORE December 25th. The language barrier meant he arrived that morning. He looked at us like we were nuts, wearing pajamas and sitting around a tree surrounded by wrapping paper. So we let him sweep it....he put down his drop cloths over the mess and got it done. Kudos to your parents for finding a tree. That is neither easy nor cheap! If you're potty training. I highly recommend the Shimajiro potty training video. Go ahead, YouTube it. If nothing else, the joy you feel from watching the video will get you through the process.